Hi everyone. First want to say what an amazing resource Maestronet is for laypersons like myself interested in violins, history, data, and science. I recently acquired a violin via auction and did a dendro to try and gain some more information about the violin. 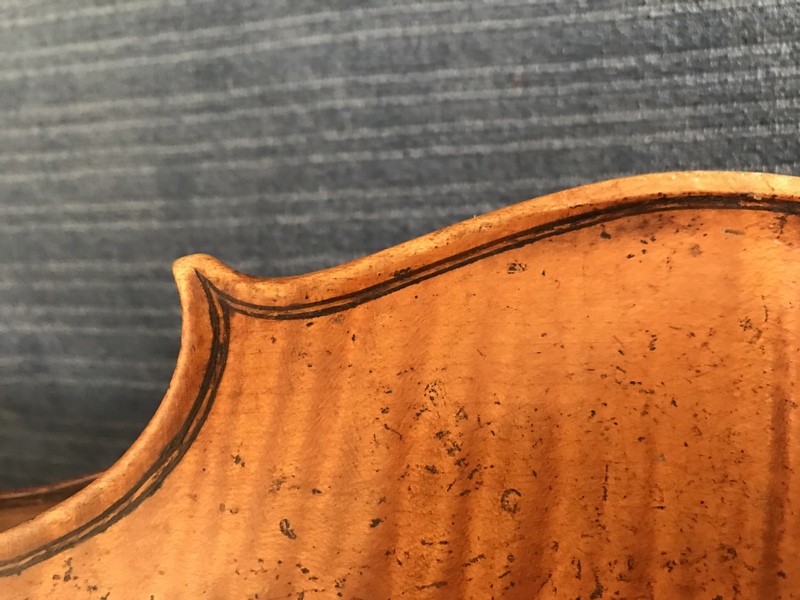 The violin is labeled as a 1743 Castagneri and at least some experts believed it to be a genuine Castagneri, but a dendro suggests that a more likely earliest creation date is 1755. 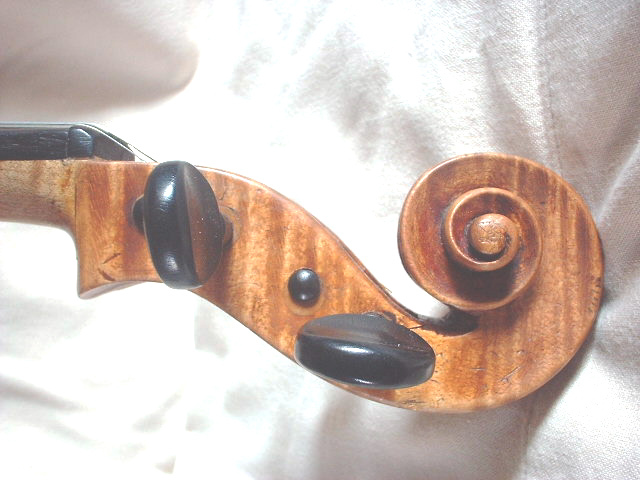 The wood is similar to many other pre-Revolution French violins but no exact tree match. It turns out that while previous researchers had put Castagneri's death at around 1760, an apparently more authoritative source puts his death at 1747 (see http://www.viaductviolins.com/maker-detail.php?maker=143 ). So the question now, is who made this violin?! 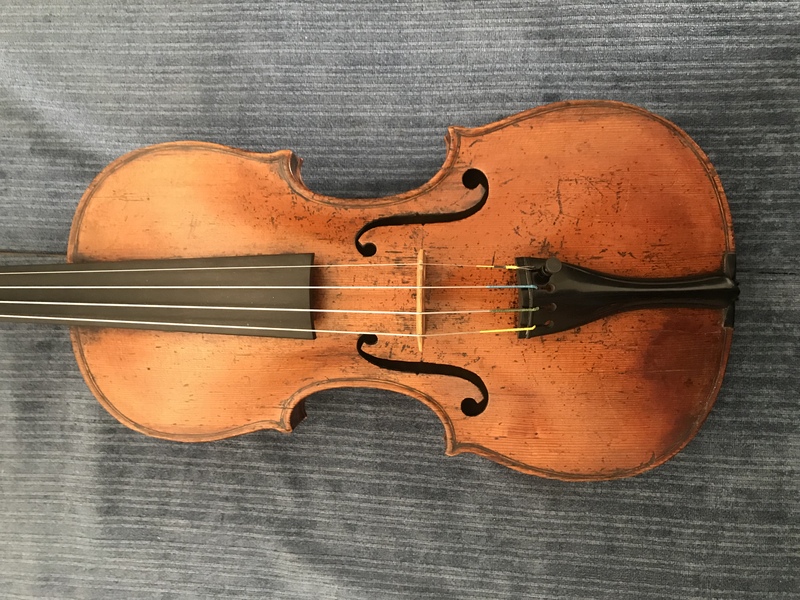 For me, the sound is fantastic and I look forward to playing it for years to come, but after reading as much as I could about Vieux Paris, Turin, Castagneri, and other makers in Paris of that era, I'm eager to learn as much as I can about the violin. I've had a few people suggest Gaffino as a possibility and I understand he took over for Castagneri at some point. However, I'd like to know what other tidbits the experts out there might have to say about this violin. 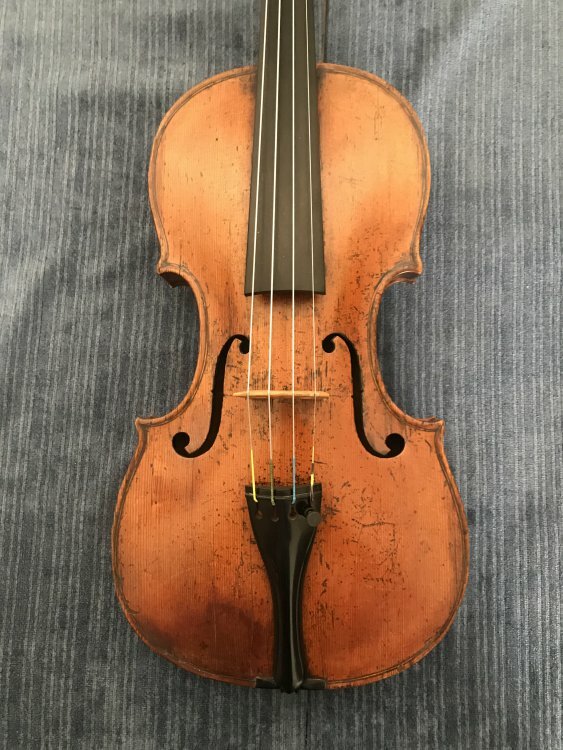 I'm happy to post any additional pics if they'd be useful, but below is a shared folder containing some images of the violin. Thanks in advance! I Just thought I would like to say what fantastic photos you have supplied. I am not an expert, but the label is a good copy if it is a facsimile. What made some experts think the violin is not what the label says ? I am a novice, but even I can see the ribs are built into grooves on the back. But an interesting anomaly is that the bottom rib is in one peice rather than two. The button appears to be a replacement,which makes one think that the neck has been removed at some point,so I wonder what the neck attatchment was originally ? Is there any internal evidence of it once being a through neck or something else ? At Viaduct violins is given an actual biography of this maker, and four reference examples - as they usually are certified by the reliable Paris experts, these might be the most possible reference examples. OTOH, in my eyes they show more or less different models and workmanship, what leaves the usual question, if all instruments bearing his label were made by himself or if he was a shop owner employing different makers or partially sold intruments made outside of his shop by others? I think it's definitely worth showing this violin to people who really know this school. I've seen a few Castagneris and this looks a bit meaty to me and maybe too flat, but I'm really no expert. I would suggest Christophe Destannes who specialises in these instruments, Jan Strick in Brussels, and of course Jean Jacques Rampal in Paris. The slightly stubby f-hole tongues remind me of a Gaffino I was shown. Personally I would rather have a Gaffino than a Castagneri. Is it big - over 36cm? Thanks very much for the info and I'm amazed that you are able to conjecture the size from photos alone. Martin is indeed correct that the LOB is 36.1cm. In my searches I could not find many example instruments from known makers of this era over 36cm further complicating my search for candidate makers. The arching seems actually quite high to me but not sure if there is a standard way to measure that. This is the first time I've seen a replacement neck in person and it appears to have been very well done, but again sample size of one for me! 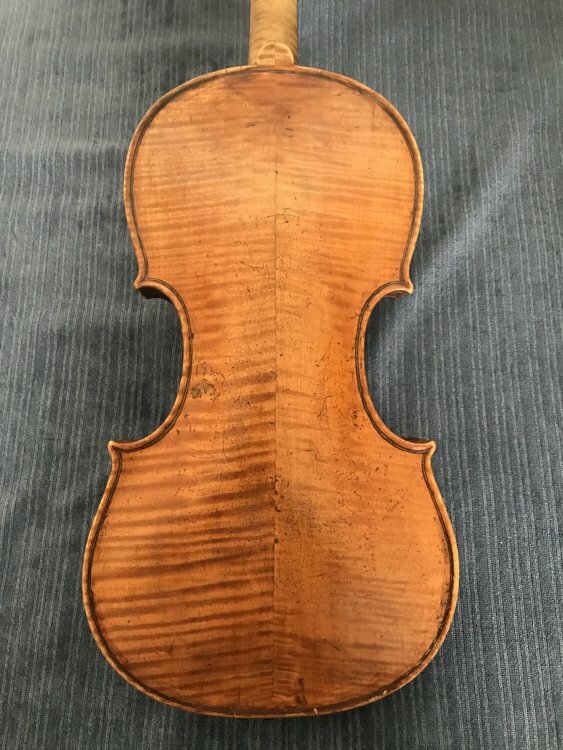 I couldnt say but i assume they have been studied in the collection by Parisian experts, one feature is the semi circular cut out in the pegbox which i cant see in the OP violin,but ive seen quite a bit of variation in supposed Castagneri violins. The pegbox doesn't appear to have a circular cutout. I just added a more detailed picture to the shared folder. Jacob's point is a very good one though - there are a few Castagneris with certificates from respected authorities floating around with dates in the 1750s that now seem to be refuted by his death in 1747. So it seems like there are fewer "reference instruments" than previously thought. Castagneri seems to be a particularly difficult maker to deal with. Genuine instruments are varied in design, although I would look towards fairly unformed corners and deep edge work as some of the indicating factors that may differentiate the real thing from one of the various makers working closely around him, and ultimately if it is very Italianate it will stand a better chance of being real than not, although I have seen some clearly genuine Castagneri violins that weren't up to much. Castagneri's that I have seen and really liked seem to be quite informal, feeling somewhat asymmetric, and typically but not exclusively with a sense of cavernous c-bouts. 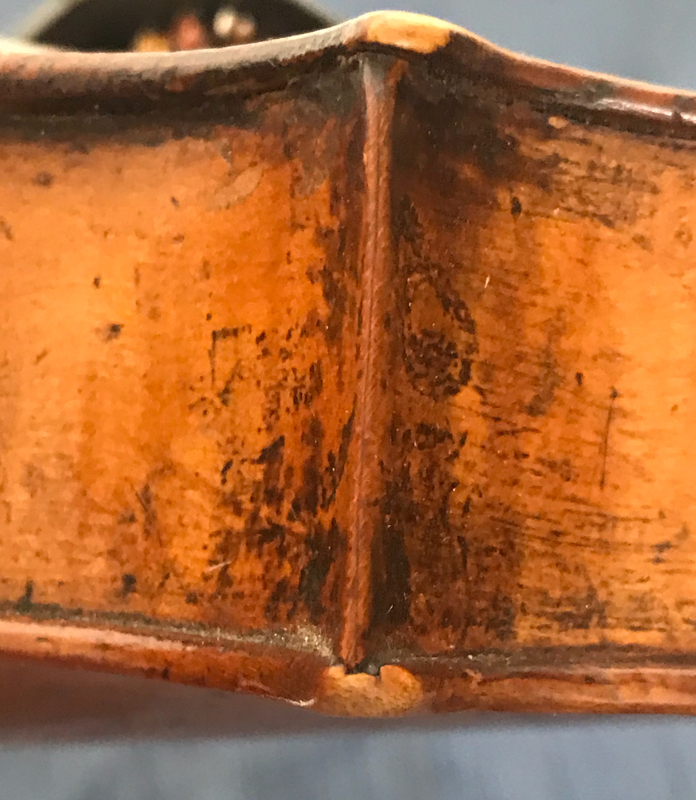 He can also be painfully difficult at marking his instruments, and I have known of examples branded on the inside of the back beneath the blocks, which is quite inexplicable, and it's really not worth pulling the back off to prove a point (or to lose an argument). None of these are hard and fast rules. 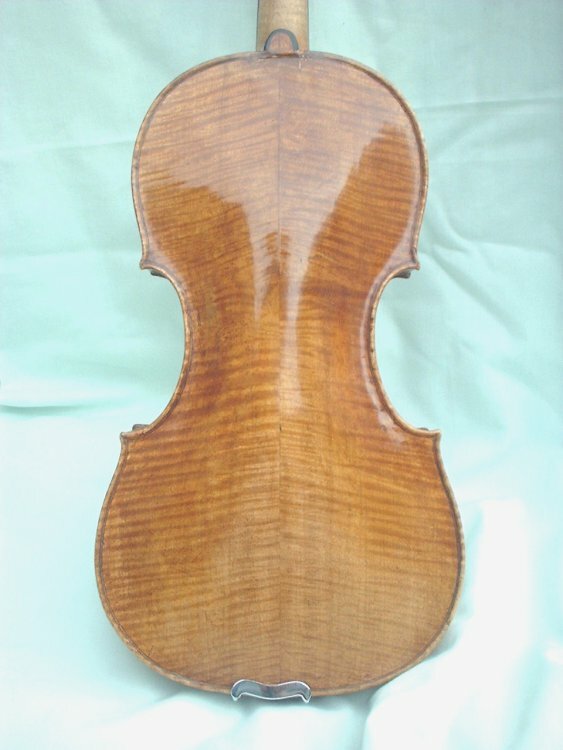 Just as it seems also to be the case that Castagneri sticks to 357mm or under, whereas many native French makers were happy to make violins well over 360mm at the time. You have various options - one is to recognise that the death of a maker may not necessarily be the end of the business run under their name. This is as true for the brothers Amati as it is for many other established makers, where a widow or a son could carry on running their business after their death, so on that basis, death dates may not always be a proof of inauthenticity. Having said that, there was certainly a workshop in France forging instruments in the eighteenth century, which focussed on emulating the works of more celebrated Parisian makers. 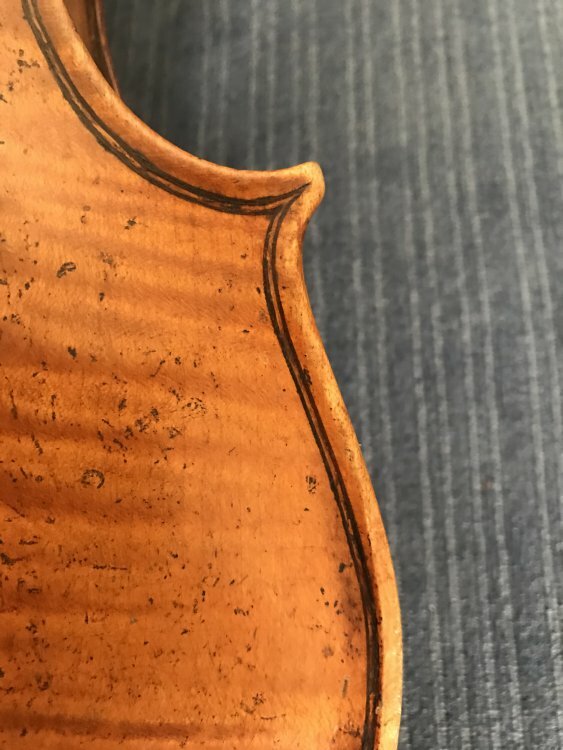 I recently had a Chappuy by this apparently later hand, which was almost identical to a violin purporting to be Florentine from 1717 complete with brands inside and the works. If people were forging violins outright, then a little bit of label swapping was certainly a possibility. Unfortunately with Castagneri, by at least as early as 1767 he had earned his reputation as one of the three most famous French makers ever to live, alongside Bocquay, and Pierray. At least according to Phillippe Macquer in his Dictionnaire Portatif des Artes et Metiers, and he is constantly quoted in French sources with the same praise into the early nineteenth century right through to the major treatises of the Paris conservatoire. As a result, there was plenty of reason to forge these labels through the eighteenth century, and I'm afraid the French were definitely at it as the typeface is the same basic "Old French" typeface introduced by Simon de Colines in the sixteenth century, it was widespread and available still. So to me, this is very much of the Castagneri school, it is too formal in its outline and the corners too squared for me to have confidence in it, and a large back length makes me less excited. I may be wrong, but I would firmly place it amongst his followers, aided in part by a firm memory of seeing an identical instrument two or three years ago with a beautiful label for Jean Philippe Michelot (also in the lovely Colines font), though I only noted that one because it was so excessively rare. But I offer no certain opinion whatsoever, Castagneri and his followers are too wily to make it easy. Where would anyone put this violin back, it did have the ribs in grooves in the back. The end of the pegbox was finished quite neatly with a semi circular gouge ?? cut which im uncertain how it was done. but not like the Castagneri type of narrow vertical cut. It looks typically 18th century French to me, although I don't think the scroll goes with it. Thanks for the details Ben! 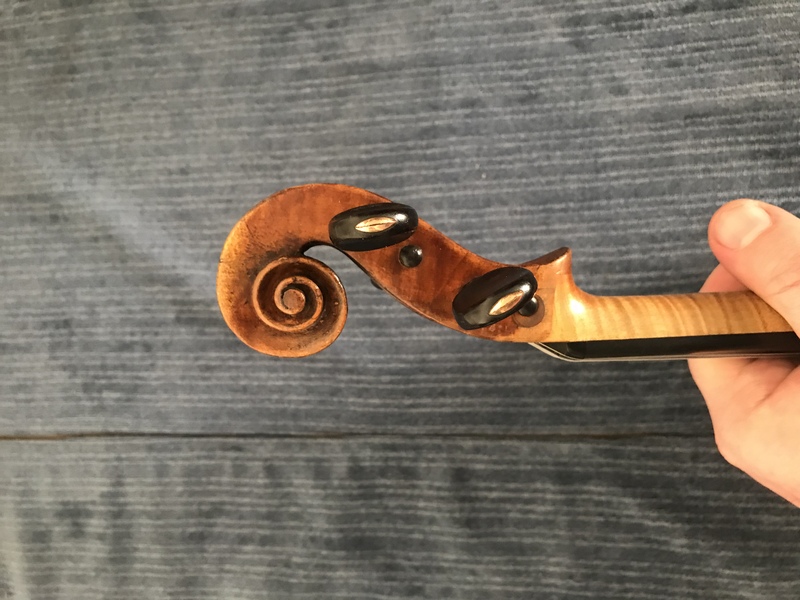 I discovered a new property of the violin when looking at the ebony pin near the button and I added a new closeup to the shared folder. It appears that the area beneath the button was scraped and a depression remains that you can feel if you rub your finger over it. I think it should be pretty visible in the picture, but it is just about the same width as the button. There is also one remaining gouge mark below this depression that to me at least does not look like an accidental ding. Maybe a brand was removed during the neck repair and a label inserted by a wily Frenchman ? Fiddle Collector - that is absolutely the corners I am thinking about, the edge work and the chasmic c-bouts (an illusion of the corners) so it would stand a very high chance for me of being the real thing, though I think the absolute experts still quibble as there are some more Italian and less Italian violins with this kind of thing. A few years ago I had something pass through that was mostly right (it probably was right) but it was bulbous like a 1720s filius Guarneri in not a very pretty way and it was particularly poor sounding. I wondered if Parisian expertise slightly prejudiced quality in the review of what "IS" a Castagneri and what can only be "school" ... we do much the same in Britain with Thomas Kennedy / Kennedy School cellos and the likes. 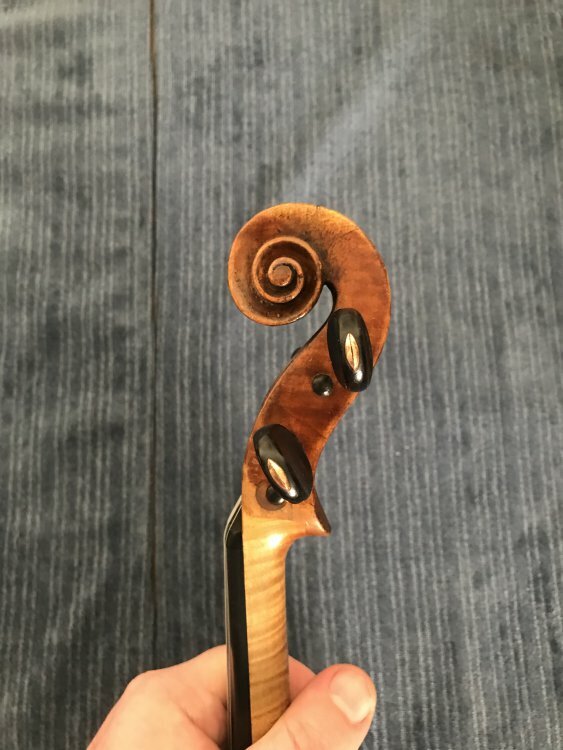 I bought an endoscope of eBay for $15 and it was fun to explore the inside of this violin. Of course I was looking for a clue that would settle the mystery of this violin's maker once and for all, but no such luck as I found very little of interest (to me at least) inside. Overall the interior seems to be in very good shape. 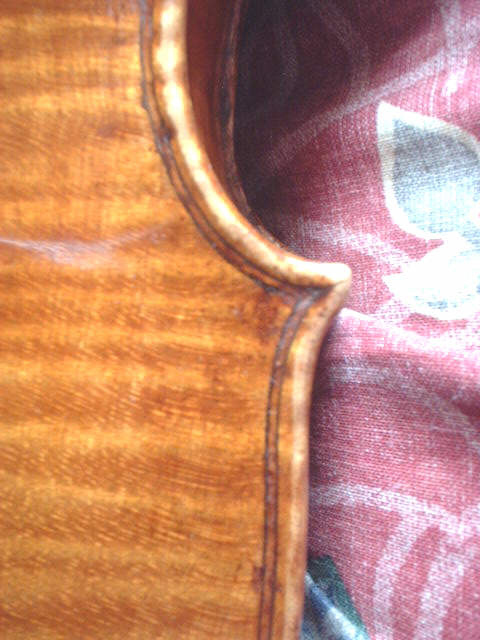 There were two small cracks that have been repaird and the center joint of the top and bottom joints appear to have been cleated when the violin was made. 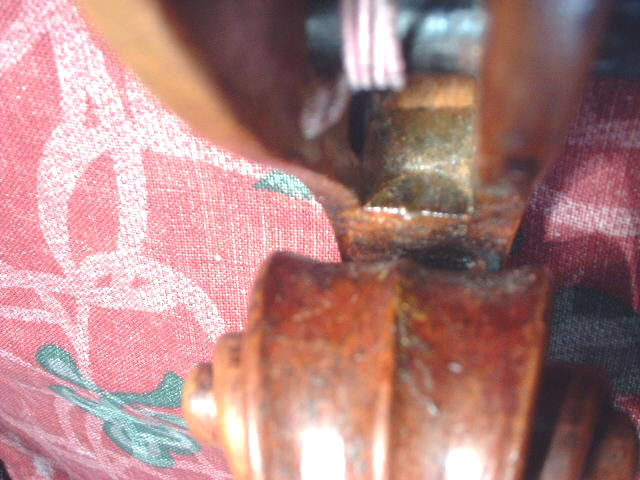 I did find a crack on the inside of the top on the treble side just off of the center joint near the neck block - you can see it in this image and there are a few more photos of the interior in this shared folder https://drive.google.com/open?id=1GzkETTdKDcZLvH2WhO1EtFsw_D6rscj3 . 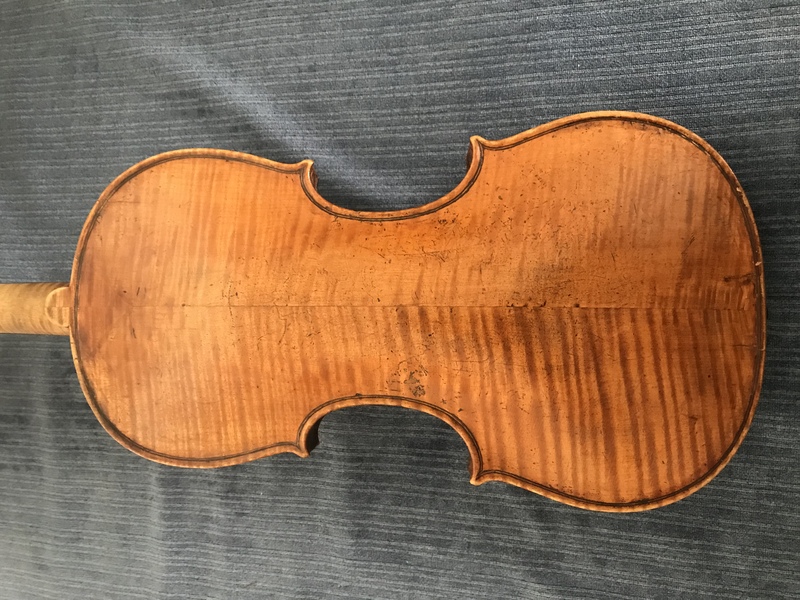 I intend to take this violin to a luthier to set it up and inspect in a few weeks but would be interested in any opinions on this crack. I cannot see any evidence of this crack when looking at the outside of the instrument (under the fingerboard but still dont see anything. Thanks! Chris, that doesn't look like a crack, that looks like a "miss" with the opening spatula when taking the top off, but I would think that if that the case, it would have been repaired then the top was off. Maybe a repairperson was trying to release this area for other reasons, like "slipping" the neck block, or just cleaning out an open seam before reglueing??? What do you others think? I would be more concerned with the poor fit of the top to the newer neck block. Might be that the poor fit put undo stress on the rib/belly seams on either side the neck block and they gave way, and a repairperson then reglued it, gouging the top unknowingly in the process?? FC and Ben, do you think the skinny belly linings are a victim to planed down ribs? Out of curiosity, is the shape of the orig endblocks similar in shape to the squarish replacement?